When we started this trip, we really didn’t have a “mission” in mind. We weren’t riding for a charity or a cause. We wanted to ride because we wanted to explore the United States. Over the course of the trip, however, we found that bicycle travel was a truly liberating experience that hardly anybody tried. People ride their bikes fast down the road or on a trail in the mountains, but bicycle travel is not actively encouraged by the bike industry (with few exceptions). The more we traveled, the more we found that we had a unique opportunity to really inspire people to get on their bikes and explore. This website and our Facebook fan page have been great tools to share our experience, but we wanted to go a step further, so we started doing presentations. 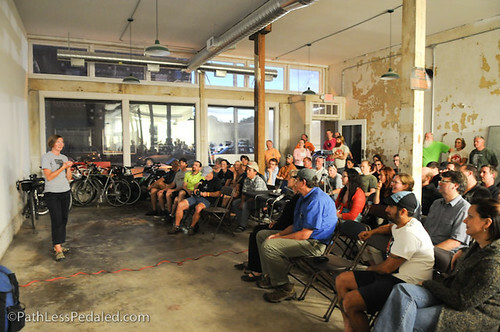 The presentations let us directly answer questions about bike touring and also provide a great way to meet up with our readers! If you can’t attend a presentation or join us on an S24O, but you have specific gear questions, Panniers & Peanut Butter is the next best thing. We hope after you read it, you feel prepared and inspired to hit the road on your own! Panniers & Peanut Butter has been out for less than a month and has already been a great hit. Thanks to all of our wonderful readers and supporters who have already bought a copy! Also, a big thanks to EcoVelo, LetsGoRideABike, BikeCommuters, RocBike and CarFreeAmerican for posting about the release. Whether you are an arm chair adventurer, a S24O tourist(get the book to find out what this means), a multi day bicycle tourist, or an adventure cyclist, you will, I promise, love this book. Laura and Russ take turns with the writing which gives this book the rich uniqueness of feeling like you are sitting across a picnic table from them. They keep it simple, only sharing information about the equipment they are using, how it works for them, and what they like best. They added some information I have never seen in other books about bicycle touring. A section on their Porch, fun. A surprisingly fascinating section on tying knots with a link to videos on how to tie knots, off beat and extremely helpful. The Office, answers the question what equipment is needed to document the tour while on it. If you’re curious about bike touring and want to learn what has worked for us over the last 14 months, get a copy of Panniers & Peanut Butter. It’s 75 pages, full of tips, reviews and photos (about 30 megabytes, so download it somewhere with a good signal). Of course, we’re also happy to answer any questions you have via email (as long as we’re not in the middle of nowhere). I hope your two can make it down to Eugene during your stay in Portland. 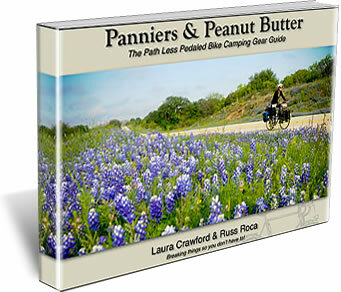 I’d like to buy a copy of “Panniers & Peanut Butter” but don’t have a PayPal account and (after an identity theft) generally prefer to pay by cash, personal check, or US Postal Money Order. Do you have a snail-mail address, or perhaps a book dealer I can order from? Thanks, y’all are awesome! Your presentation has inspired a few people here in Bryson City to take to the road. One friend joined me for a week on the Blue Ridge Parkway, and not long after you left, Andy had a new touring bike roll through the door of Bryson City Bicycles. Plans are in the works for Diane and Andy to join us to do a tour of the Outer Banks of North Carolina soon. You are still the topic of conversation around our little town. Thank you both for stopping and spreading the word!